Citi Bike, America’s largest bike-sharing system opened in New York City on Monday. Photo by shinya. 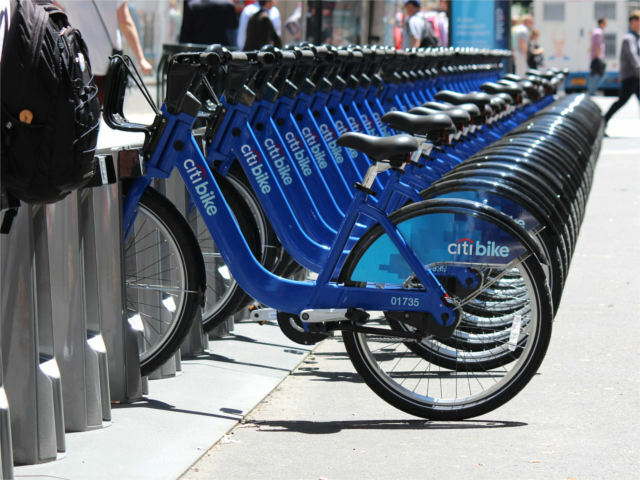 New York City has joined the ranks of U.S. cities now offering bike-sharing systems. Sponsored by CitiBank and launched on Monday, Citi Bike offers residents, commuters, and visitors to the “Big Apple” an additional mobility and urban connectivity option, in the form of 6000 bicycles parked at 330 stations across Manhattan and Brooklyn — two of NYC’s five boroughs — making Citi Bike not only the newest, but also the largest bike-sharing system inaugurated in the US to date. Over 15,000 New Yorkers have joined the Citi Bike network as annual members thus far. For $95 per year, members receive an unlimited number of trips, a key to unlock a bike from its dock, and a 45-minute window of travel time per trip. In order to promote rider safety members also receive a discount on helmets from Citi Bike, and New York City’s Department of Transportation has set a goal to distribute 100,000 free helmets to riders this year. Aside from the health and environmental benefits that cycling offers, the bike-sharing system is expected to create 170 jobs and generate USD$36 million in local economic activity for the city each year. Other active bike-sharing systems in the U.S. include Hubway, in Boston; Denver’s B-cycle system; Miami Beach’s Decobike; and Capital BikeShare, in Washington, DC. A number of college and university campuses across the US have also implemented their own bike-sharing programs on campus grounds — many of them free for students to use. Several more cities are in the planning stages, with bike-share systems in Chicago, Illinois and Columbus, Ohio scheduled to begin operations this summer. To learn more about Citi Bike, check out their website. Do you use the Citi Bike network? Tell us about your experience in the comments section below! Tags: B-Cycle, bike-sharing, Boston, Capital Bikeshare, Citi Bike, cycling, Decobike, Denver, helmet, Hubway, Integrated Transport, Miami Beach, Michael Bloomberg, New York City, North America, road safety, United States, Washington, D.C.